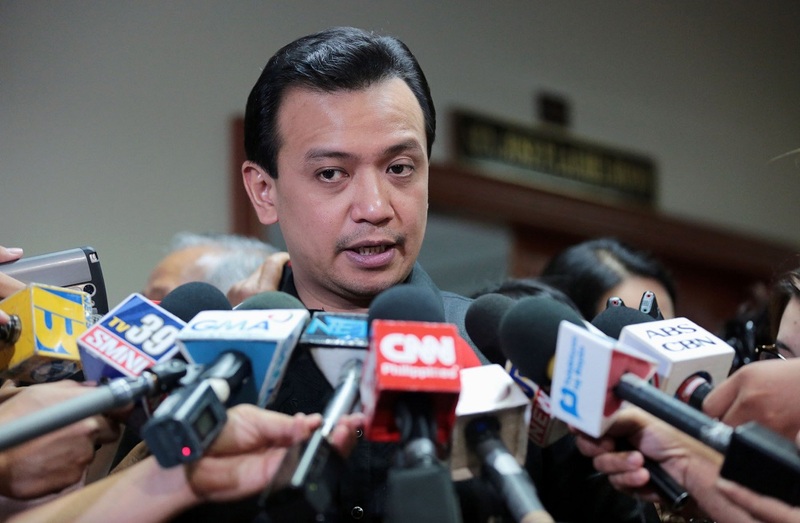 MANILA – Malacañang on Wednesday dared Senator Antonio Trillanes IV to produce his duly received copy of the amnesty application form, which must contain the former Navy officer's admission of guilt of the crimes of rebellion he committed during the time of former president Gloria Macapagal-Arroyo. “The rules of court will apply. The best evidence says that he has to produce the original and if the original cannot be produced, prove the circumstance why he cannot produce,” Roque said. “Nasaan ang application form mo? Dahil wala nga po sa AFP (Armed Forces of the Philippines), eh ang presumption ay wala talaga siyang sinampa at siya mismo ay walang maipakita. (Where is the application form because there is none in the AFP. So the presumption is, he really did not file and he himself has no copy),” Roque said in a radio interview. “Sisihin niya po ang sarili niya dahil hindi niya tinago iyong kaniyang duly received copy ng kaniyang application form (He should blame himself because he did not keep properly his duly received copy of his application form),” he added. The missing amnesty application form prompted President Rodrigo Duterte to issue Proclamation 572, declaring void ab initio (from the beginning) the amnesty granted to Trillanes by former president Benigno Aquino III in 2010. Trillanes’ failure to submit his amnesty application documents has also led to the issuance of an alias arrest warrant and hold departure order against the senator by the Makati Regional Trial Court Branch 150. On Tuesday, Trillanes used the Senate deliberations on the budget for Department of National Defense to insist that he filed the amnesty in 2010. During the hearing, AFP Chief of Staff Carlito Galvez said the former head of the amnesty committee secretariat had told him that Trillanes applied for amnesty but documents could not be found due to some lapses.